Empty device list on Monflo Client – what to do? 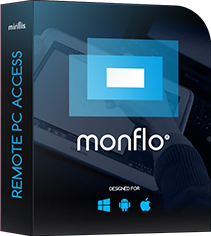 This tutorial will solve your problems with empty devices list when installing Monflo Client on your mobile Android device for the first time. Also, you can learn how to delete your listed devices from lists on Windows PC and Android devices. If you see that your device list on your android device looks like presented above you should install Monflo Server on the PC you want to remotely control [download Monflo Server app] or ask your friend who uses Monflo Server application to create an invitation for you [tutorial on creating invitations]. After following one of these steps your list, with already a device addes, should look like presented below. On Windows PC: when your devices list is open click the remove icon from the device's bar and confirm the action. ATTENTION! When you delete the device from the list it will be required to run Monflo and login on this device to add it to the list again.